Real ghouls don’t raid graves. This misrepresented creature of fright needs to be redeemed. “Ghoul” is a word that is associated with graveyard robbing, flesh-eating creatures that go bump in the night. It is time to disentangle their evil reputations from this horrible image. This is their history in as few words as possible. Ghouls originated with Arabic Bedouins. The bane of travelers, ghouls were renowned for getting people lost in the desert. Like the Sirens of Greek mythology, ghouls could use their voices to lure unsuspecting travelers deep into the desert where they would be lost forever. Or eaten. They appeared in other ways as well. Sometimes when an individual fought and killed an animal for supper, it suddenly transformed into a cloven featured creature on the way back to camp. Goodbye dinner, hello ghoul. You see, traditional ghouls are accomplished shape shifters. Often depicted as women, ghouls are not the ghosts of departed souls – they arise from a very different place. Ghouls are the offspring of demons. With bonafide demonic DNA, they have a penchant for human flesh. As the definition suggests, Western culture depicts ghouls as grave opening, corpse eating monsters. A quick browser search will reveal that most definitions of “ghoul” include the graveyard aspect. Perhaps the more sensational version of the ghoul makes a more gripping story image, but it is not a correct one from a folkloric perspective. The traditional Arabic ghoul is not that disrespectful. This ghoulish, corpse-eating twist to the lore of “ghouldom” is attributed to Antoine Galland, a Frenchman who translated the Arabian Nights in the early 1700’s. One story, called The Story of Sidi Nouman, tells of a man who is married to a woman with such a small appetite that one grain of rice at a time was all she could manage. Though their marriage was happy as marriages go, he wondered about a couple of things – her appetite quirk and her strange habit of leaving home in the middle of the night. One evening, he quietly followed her when she stole out of the house. As he approached the graveyard where she had gone, he watched in silent horror as his wife dug up graves and devoured corpses. No wonder she ate like a bird all day. That was when he realized that he had married a ghoul who was adept at shape shifting into a beautiful woman. 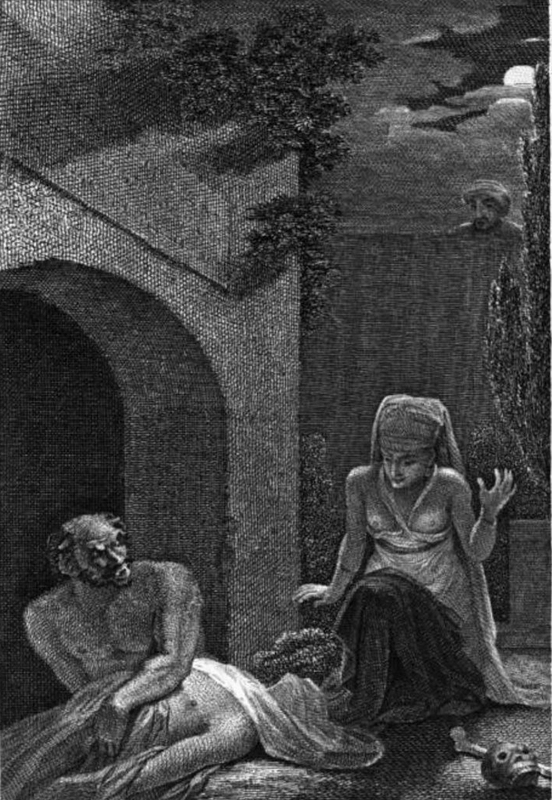 According to folklorist Ahmed Al-Rawi, grave robbing and corpse gorging were either Galland’s invention or his mistaken representation of other Middle Eastern folklore as Arabic. Galland’s gruesome image was then perpetuated in literature, including popular Victorian writings. The new meaning fell into common language use and western popular culture. Now ghouls the all over the world pig out in cemeteries. To put the folkloric record straight, that is not how they started their ghoulish business. The world’s first ghouls caused desert travelers to become lost in the sand, which put them inside a ghoul’s sandwich. In short, lost travelers became desert dessert. Were the first ghouls nasty and hungry? Sure, look at their parentage. But the first ghouls didn’t defile the buried dead for food. That was going a bit too far. What is a ghoul to you? Do you have favorite ones from literature, folklore, or film? Melton, J. Gordon (2011). The Vampire Book: The Encyclopedia of the Undead, Third Edition. Visible Ink, Press.